With a four goal output in their last game, the top of the Kings’ offensive leaderboards saw a few changes. Jeff Carter is pacing the team with four goals and six different players are now tied for the points lead at five each. Perhaps the most surprising in that group is Simon Gagne, who’s yet to score a goal this season, but still has five assists. Nashville goaltender Pekka Rinne is only 6-5 in 11 career games vs the Kings, with one of those wins coming via a shootout last week in LA. Dustin Brown had a fine evening against him that night, scoring in regulation and in the shootout. Forward Dwight King has suited up for just 40 NHL games in his young career, but four of those contests have come against Nashville. Interestingly, his first three games vs. the Predators came over a five-week period after his call-up from the AHL last season. He also has one goal against Barry Trotz’ team. So, who will score the first goal tonight? For anybody new to the scene here, this contest is simple. Place a comment below with the LAST NAME of the LA Kings player you think will score first vs. the Predators (one entry per person). We’ll take all of the correct entries and pool them together. From that group, one random winner will get a prize. Today you’re playing for the t-shirt to the left. 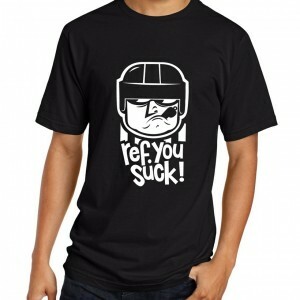 It comes to us from longtime MayorsManor sponsor RefYouSuck.com – they have a full selection of hats, shirts and sweatshirts. So, after you enter the MayorsManor First Goal Contest, be sure to head over to their site and check out all the good stuff they offer. Gagne, it came to me in a dream.